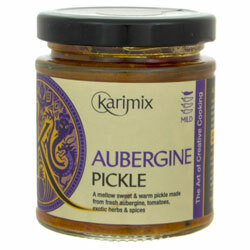 Karimix Aubergine Pickle is a mellow sweet and warm pickle made with fresh aubergine, tomato, exotic herbs and spices. Add to chickpeas, courgettes and onion, then pan-fry or bake to create a wonderful quick meal. Sprinkle with grated cheese before serving. Eat as a dip with tortilla chips or vegetable crudite. Adds a delicious punch to salads, stir-fries and on the side of meat pies. 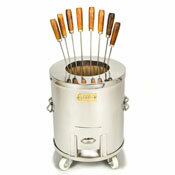 Serve as an accompaniment to your favourite curry with warm naan breads. • Mix together the Karimix Tomato Chutney and Karimix Aubergine Pickle. • Use as a dressing and lightly toss the sliced tomatoes and lettuce. • Arrange the salad on plates, and drizzle with olive oil (if using). • Delicious as a side dish to kebabs. Ingredients: Aubergines 22%, Onions, Tomatoes, Vinegar, Sugar, Oil, Water, Spices, Garlic, Ginger, Salt, Yellow Mustard Seeds, Curry Leaves. Once opened, refrigerate and use within 4 months. Allergy Advice: contains Mustard and is made in a factory using Nuts. 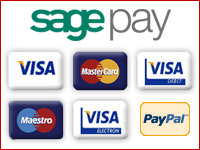 "Dear Spices of India, My first order was placed late Tuseday and it arrived before lunch Thursday! Thankyou very much!"